In Prince Edward County, the opinions about the Drake Devonshire are mixed – it’s a nice place to hangout (in an area where there’s not a lot of bars or places close early) but it feels too “Toronto”. In fact, locals are baffled by why Torontonians want to escape to the county just to hang out in the city again. To be fair, the venue is nothing like the multi-floor Drake Hotel downtown or the retro Drake 150 in the financial core. 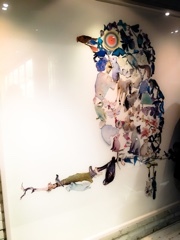 To start, the sprawling building overlooks the lake and the décor is lighter and whimsical. For another, the food is much better than the Drake Hotel. 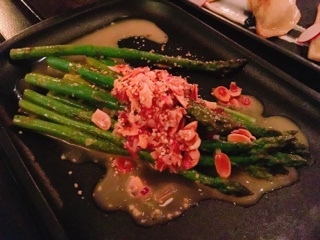 The asparagus almondine ($14) is a simple starter, the spears of asparagus lightly roasted and topped with slivers of toasted almond in brown butter. A squeeze of lemon adds a hit of acidity, but otherwise the nut and vegetable are the prominent flavours. It’s a little plain as a starter, and works better as a side. Their warm dandelion Caesar ($14) is on the other side of the spectrum - packed with flavours: the slight bitterness of the dandelion, garlicky dressing, a faint umami essence from the bonito flakes, sweetness from the dry crispy pork floss pieces (in lieu of bacon) and salty pecorino sprinkles. 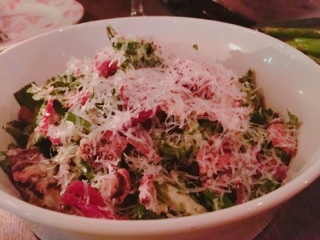 It’s tasty, but best shared as an entire dish of the Caesar would be fairly overpowering. 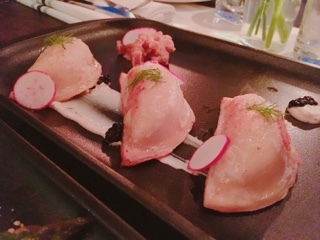 Perhaps, the sole starter, I tried, that could stand on its own is the salt cod pierogies ($12). The chewy soft dough was a tad thick, but there was plenty of salt cod mashed potatoes inside. I’ll admit, the slightly fishy filling requires getting used to, but once you add some of the tangy crème fraiche or thick apple sauce, it gets tastier. 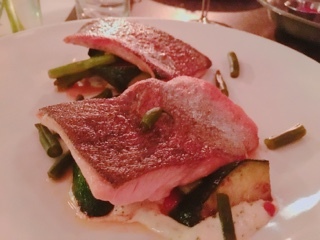 Overall, the Devonshire prepares fish pretty well. 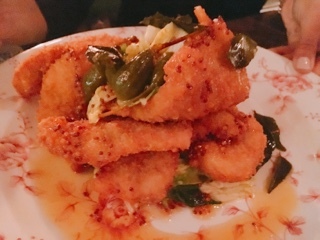 The trout’s ($28) skin could be crispier, but the meat was moist and flakey. Being an oilier fish, it was properly paired with a refreshing vegetable medley consisting of roasted red peppers, zucchini, and green onions. Once in a while, you’ll also get a sour crunch from the fermented green beans. 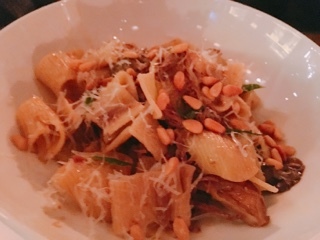 For me, the lamb rigatoni ($24) incorporated too many frou-frou items - hen of the woods mushrooms, pine nuts, and spruce? Sure, I guess the spruce and the mint will help alleviate any of the lamb’s gaminess, but all together the elements detracts from having the rigatoni become that rich homey dish that’s notorious with pasta. 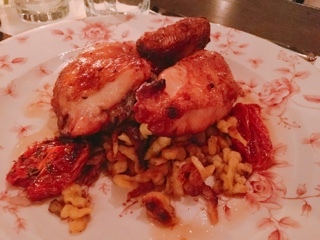 Although I found the Prinzen chicken ($27) dry (it could have been the piece of breast I cut from the side), my friend found it was cooked well. For me, it was the saffron spaetzle that stole the show: soft and chewy with a well toasted crust – exactly what I crave with this German pasta side dish. You won’t leave hungry with an order of the pork schnitzel ($26) – I lost count of how many pieces were actually included with the dish. To be fair, I wouldn’t classify it as schnitzel as the slices were way too thick. If they’re named breaded pork cutlets with honey mustard, it would be more accurately described. 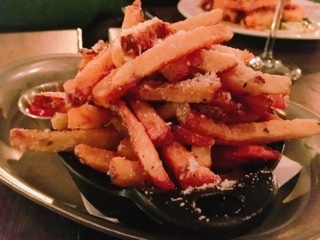 The truffle and cheese fries ($11) were okay – it’s hard for fries to be terrible, but the Devonshire could ensure they arrive hotter and there’s more truffle oil if you’d classify these as “fancy fries”. Meanwhile, the hakuri turnips ($9) were surprisingly good – the mini root vegetables remained crunchy having been lightly poached and then sweetened with burnt honey. Drake did not save the best for last … the tiramisu ($10) and lemon meringue tart ($10) were merely passable. Although they were plated nicely, the desserts taste like something found in a buffet – and we’re not talking the one at the Bellagio here. 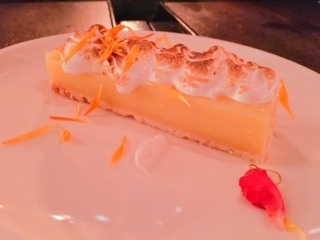 The lemon meringue had a nice toasted top, but the lemon custard was thick and almost plastic-like, while the tiramisu so heavily orange flavoured in lieu of espresso. For being in a location where guests may be visiting to celebrate occasions, the Drake Devonshire certainly doesn’t treat these events with much care. In town for a bachelorette, my friend informed the host about the celebration and asked for a bottle of wine to be brought to the table as a surprise (a present from a friend who couldn’t attend) and to do something festive for the dessert. Neither worked out as planned: our waiter came by to tell us the wine requested wasn’t available (in front of the bride, so any surprise element was ruined) and her dessert came without fanfare. Note 1 to Drake’s management: please set-up some sort of communication system between staff members (hosts, waiters, and the kitchen are a team). They tried to make up for this by comping her dessert and giving us tickets to use at the photo booth. Only when we went to take the pictures, another staff member came by to hush us as there is a guest room located right beside the booth. Really, why would a manager appease disappointed diners by giving them something that they can’t use freely and could potentially make another guest’s stay worse? Note 2 to Drake’s management: make sure your “make it right” solutions actually serve their purpose. 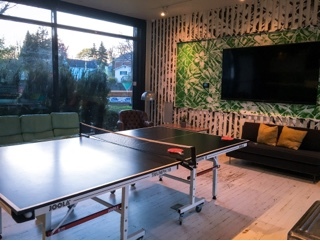 Maybe the County natives have it right – sure the Drake Devonshire has a ping pong table and funky artwork – but can’t you get that back in the city? If you’re looking for a place to hang out and have a drink after dinner, the restaurant is an ideal place. But, if you really want the County charm of laid-back hospitality, you may need to head elsewhere.